Nov. 7, 2013. Scientists using data from the lunar-orbiting twins of NASA’s Gravity Recovery and Interior Laboratory (GRAIL) mission are gaining new insight into how the face of the moon received its rugged good looks. A report on the asymmetric distribution of lunar impact basins is published in this week’s edition of the journal Science. 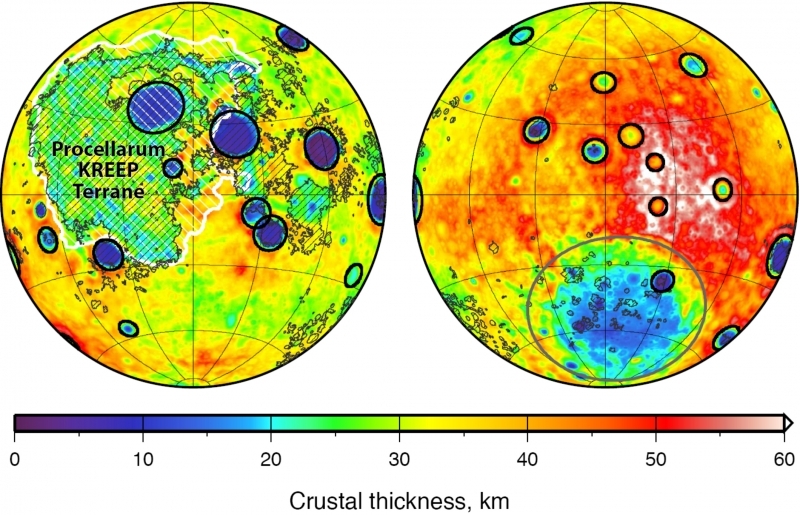 Global map of crustal thickness of the Moon derived from gravity data obtained by NASA’s GRAIL spacecraft. The lunar near side is represented on the left hemisphere, and the far side is represented in the right hemisphere. In the left hemisphere, outlined in white, is the Procellarum KREEP Terrane, a large province on the near side of the Moon that contains high abundances of potassium, rare-earth elements and phosphorus. Excluding the Aitken basin at the south pole (the gray circle on the lower half of the far side hemisphere), there are 12 impact basins with crustal thinning that have diameters greater than 200 kilometers on each hemisphere. Those are marked with black circles. The image is presented in two hemispherical Lambert azimuthal equal-area projections centered over the near side (left), and far side (right) hemispheres. Image credit: NASA/JPL-Caltech/S. Miljkovic. Scientists have long known that the temperatures of the near-side hemisphere of the Moon were higher than those on the far side: the abundances of the heat producing elements uranium and thorium are higher on the near side than the far side, and as a consequence, the vast majority of volcanic eruptions occurred on the Moon’s near-side hemisphere. The new GRAIL research is also helping redefine the concept of the late heavy bombardment, a proposed spike in the rate of crater creation by impacts about 4 billion years ago. The late heavy bombardment is based largely on the ages of large near-side impact basins that are either within, or adjacent to the dark, lava-filled basins, or lunar maria, named Oceanus Procellarum and Mare Imbrium. However, the special composition of the material on and below the surface of the near side implies that the temperatures beneath this region were not representative of the Moon as a whole at the time of the late heavy bombardment. The difference in the temperature profiles would have caused scientists to overestimate the magnitude of the basin-forming impact bombardment. Work by GRAIL scientists supports the hypothesis that the size distribution of impact basins on the far-side hemisphere of the moon is a more accurate indicator of the impact history of the inner solar system than those on the near side. Launched as GRAIL A and GRAIL B in September 2011, the probes, renamed Ebb and Flow by schoolchildren in Montana, operated in a nearly circular orbit near the poles of the Moon at an altitude of about 55 kilometers until their mission ended in December 2012. The distance between the twin probes changed slightly as they flew over areas of greater and lesser gravity caused by visible features, such as mountains and craters, and by masses hidden beneath the lunar surface. JPL, a division of the California Institute of Technology in Pasadena, Calif. managed GRAIL for NASA’s Science Mission Directorate in Washington. The mission was part of the Discovery Program managed at NASA’s Marshall Space Flight Center in Huntsville, Ala. NASA’s Goddard Space Flight Center, in Greenbelt, Md., manages the Lunar Reconnaissance Orbiter. Operations of the spacecraft’s laser altimeter, which provided supporting data used in this investigation, is led by the Massachusetts Institute of Technology in Cambridge. Lockheed Martin Space Systems in Denver built GRAIL.